Did you know that you don’t need a third-party feed service to deliver an RSS feed? It’s no secret, but using a service like Feedburner has become a common best practice for feed delivery among bloggers and marketers alike. The service is free so there’s no risk involved (theoretically) and using a feed service isn’t something that marketers see as an option. Why? Without a feed delivery service, there’s no way for you to see who has subscribed to your RSS feed and where they came from, not to mention you’re unable to support subscription by email. If you can’t view statistics, you can’t measure your progress, and if you can’t measure your progress, you can’t monetize your results. Feedburner is a free service purchased by the fine folks at Google, who have a history of sometimes killing off or rolling up useful software. Six years after its acquisition, it looks like the popular RSS feed delivery service Feedburner may be the next to fall. The Feedburner forum is dead. 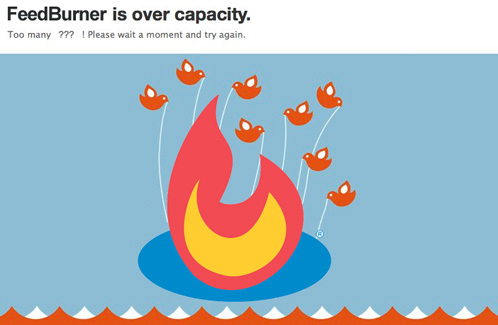 The Feedburner Twitter account is dead. The Feedburner blog is dead. What little support documentation Feedburner had isn’t being updated. Some bloggers claim that their RSS feeds are not updating at all anymore. We're signing off from this account. Thanks for being a loyal follower of @feedburner over the years! At Convince & Convert, we didn’t want to wait around speculating any longer, so we made a switch. Feedburner’s blog statistics have historically been known as unreliable and varying. For a blog that has more than 16,000 subscribers, unreliable numbers aren’t good enough for us. We want to know where our subscribers are coming from and who they are so we can provide the most valuable content. When we learned about Feedblitz’s capabilities as they relate to our valuable feed, we were intrigued. In short, Feedblitz is a business (it’s not free like Feedburner) but it also operates like a business, and that’s a worthy trade-off for us. Phil Hollows, the founder of Feedblitz, has a deep level of understanding of what it’s like to be a frustrated Feedburner user. As a result, he’s put together a comprehensive and practical guide for switching your feed over from Feedburner to Feedblitz. Its step-by-step instructions are extremely simple to follow, include screenshots for the visual learners, and make the seemingly overwhelming process a breeze. There is a certain level of satisfaction when you can put the pieces in place, click one button, and watch your RSS numbers rise inside your Feedblitz account. His team has also developed a WordPress plugin that finds every instance of your feed URL and routes it through your Feedblitz feed. This way you can always use your blog’s native feed and monitor all subscribers to the site, whether they’re subscribed through your native feed or your Feedblitz feed. After your free 30-day trial, Feedblitz requires that you pay a monthly subscription fee that depends on the number of active email subscribers. In other words, if you only have RSS subscribers, Feedblitz’s services are a mere $1.49/month, but if you’re delivering blog posts by email you’ll pay an additional fee. 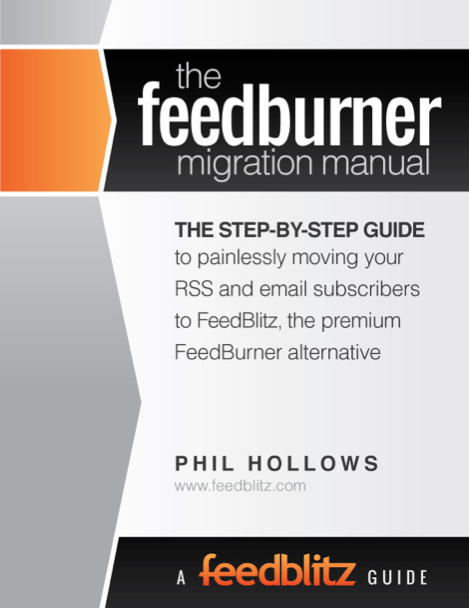 This might seem unappealing to users who have never paid for an RSS feed delivery service, but when compared to the alternative at Feedburner (free service = no support + ads) this was a no-brainer for us. Not only can the Feedblitz team guide you on any technology issues (deactivating your Feedburner account is a scary thing, we know), their team is able to advise based on best marketing practices, not just best feed practices. Delivering ad-free blog posts to our readers’ inboxes was an important priority for us. When we found out we didn’t need to use any pre-made templates for our emails, we were delighted. We had been looking to streamline our design to match the new site, and our One Social Thing email newsletter (which we rely upon our awesome pals at Infusionsoft to send). Feedblitz allowed us to copy the HTML from the existing One Social Thing newsletter template and modify it slightly to pull in an excerpt of new blog posts, add our sponsors, and include a promotional area for upcoming news and events. The best part is that we can modify these custom content areas in our template without having to dig into the HTML. All of our core email marketing and contact management is done through Infusionsoft, and we were worried about using multiple systems (Infusionsoft + Feedblitz) to manage our email lists. We didn’t want users to have to re-subscribe or get pushed over to the wrong list. This was not an issue, as Feedblitz helped us create a custom parser that pulls email subscribers directly in from Infusionsoft. No need to create new lead forms, no need to copy over existing lists. The only importing we needed to do was outlined in the Feedburner migration manual. We’ve been using Feedblitz for a few weeks now and are feeling comfortable with the stability of our feed delivery. We’re able to pull delivery metrics, referring pages, circulation, and drill down by type of blog post, topic, and more. If you’re subscribed to receive our blog posts by email, we hope you’re enjoying the new look. If you’re not yet subscribed, feel free to subscribe by email or through an RSS reader and let us know what you think. Are you thinking about switching off Feedburner? What’s holding you back? We’re happy to answer any questions you may have about it. Just let us know.